On April 21st, Google is expanding their use of mobile-friendliness as a ranking signal. Some have coined the phrase for this event as the B2B Mobile SEO-Pocalypse. Mobile search represents 30% of search traffic regardless of your industry according to seoClarity. 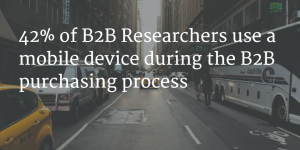 Google recently reported that 42% of researchers use a mobile device during the B2B purchasing process. Most of us in B2B are behind the times in this internet thing, and mobile is no exception. What Google is saying is that if your site is not mobile friendly, then when someone is searching using a mobile device they will rank “mobile-friendly” sites higher than your site. Thus you lose traffic. Maybe a lot, maybe a little. It could be a very big issue for your company. Want to figure out how much traffic you might potentially lose? Check out Search Engine Lands step by step method. They even have an excel spreadsheet to download. Test your site out on Google Mobile Testing tool. Do these 3 things to get ready. For now, ignore my article “The Problem with Responsive Design” and get RESPONSIVE IMMEDIATELY. This is exactly the stop-gap solution that I talked about. Once you have fixed the problem, now go back and read my issues with Responsive Design.